I was listening to an interview on the radio earlier today with a spokesman for Hamas. The interviewer asked the spokesman why Hamas was continuing to fire rockets despite their ineffectiveness against Israel (since the start of Operation Protective Edge, Hamas has only killed 2 Israelis). He replied that the Palestinians had a right to self-defense. In my most recent post about this conflict, I’ve seen similar arguments being made by Israeli sympathizers–“no coutry would put up with” the rocket fire Israel endures, and Israel has a right to self-defense. These arguments are deeply flawed because they fatally misconceptualize what self-defense is. We must be using force or violence of some kind. We must be preventing someone or something from doing harm to us. If we are not using force or violence, we are not engaging in self-defense, even if our action is aimed at preventing someone or something from harming us. If I run away from a bear, we would not call my action “self-defense”, because I am not using force or violence against the bear to protect myself, but am instead fleeing the scene. Conversely, if I’m using force but not successfully preventing myself from coming to harm, I may be attempting self-defense, but I am certainly not doing so successfully. If I know that my tactic is not going to be effective, it would be silly to characterize it as self-defense at all. If, for instance, I am stung by a bee and I respond by locating the bee hive a significant distance from me and whacking it with a baseball bat, I am not really defending myself in any meaningful way–the force I’m using against the beehive will not prevent the bees from stinging me but will only serve to further antagonize them. My action would be more reasonably described as “retribution” or “revenge” rather than “self-defense”. Disarmament–when the defender takes away the attacker’s access to the means of doing of harm. If one state destroys another state’s munitions factories, this would be a form of disarmament. Incapacitation–when the defender inflicts a harm on the attacker that prevents the attacker from further attempting to do harm. If I shoot an attacker in the knee, I have incapacitated him. If a state destroys another state’s military forces, it incapacitates that enemy state. Deterrence–when the defender inflicts a harm on the attacker to show the attacker that the costs of continued harm are too high such that the attacker voluntarily stands down. If I kick an attacker in his nether regions, this might cause the attacker so much pain that while the attacker might still be capable of inflicting further harm, he decides to refrain from so doing. If a state causes mass suffering for the people of another state, that state might cause its opponent to surrender to avoid incurring further pain (e.g. the US’ rationale for using nuclear weapons against Japan during World War II). Are the policies being employed by Israel or Hamas effective means of disarmament, incapacitation, or deterrence? Let’s consider each perspective in turn. Hamas has been indiscriminately firing rockets at Israel in reaction to the policies Israel pursued in the wake of the kidnapping and execution of three Israeli teenagers, which Israel, rightly or wrongly, blames on Hamas. Hamas perceives Israel as having harmed the Palestinians through mass arrests, mass home searches, border closings, and the brutal kidnapping and murder of a Palestinian teen in retaliation by Israeli extremists. Hamas claims its rockets are a legitimate means of self-defense against Israel. Hamas’ rockets certainly are violent, but do they constitute an effective means of disarmament, incapacitation, or deterrence? 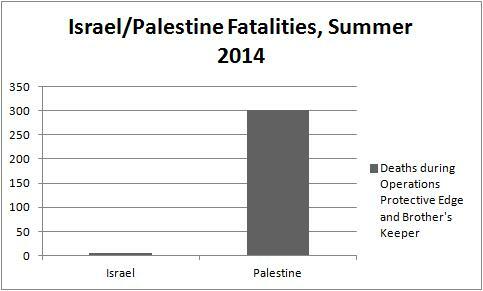 That’s 302 Palestinian deaths to 5 Israeli deaths, a ratio of 60.4 dead Palestinians per dead Israeli. This ratio has worsened since my last piece on this subject written on July 12, when the ratio was only 41 to 1. Clearly, Palestinian rocket fire has not been able to prevent Palestinians from coming to harm. Hamas has not been able to deny Israel access to its weapons, incapacitate its military forces, or deter it from continued violence. Indeed, arguably Hamas’ rocket fire has only served to legitimize Israeli violence in the eyes of Americans and enrage Israeli citizens, 53% of whom are now opposed to a ceasefire with Hamas, compared to 35% in favor. The rocket attacks are not effective forms of self-defense and cannot be justified by appeal to self-defense. Indeed, they seem to provoke further Israeli violence against the Palestinians rather than deter it. But is Israeli action any better? As we saw above, Hamas’ ability to inflict harm on Israelis is quite limited relative to Israel’s ability to inflict harm on Hamas and the Palestinians more broadly. Israel initially reacted to the murder of the three Israeli teens, which it attributed to Hamas and interpreted as an act of war. The actions it took while searching for the teens and attempting to prevent further violence against Israelis backfired, resulting in a dramatic increase in rocket fire coming from Gaza. The Israelis’ mass arrests, mass searches, and border closings were viewed by the Palestinians as a form of collective punishment. The Palestinians in Gaza see themselves as living in a large cage, imprisoned en masse by the Israelis. In the words of the Hamas spokesman I referenced at the top of the piece, some of the Palestinians feel they have “nothing to lose”. Their living standards are so poor that some of them see their lives as hardly worth living–indeed, the most radical among Hamas’ supporters likely see martyrdom as a legitimate option, if not outright desirable. Radical Palestinians see any resistance against Israel, no matter how futile, as justifiable and good. These Palestinians are mistaken–futile, ineffectual resistance makes it even harder for the Palestinians as a group to improve their prospects for statehood and economic opportunity. Nevertheless, this attitude should have made it clear to Israel that Hamas would not respond to further imprisonment, search and seizure, movement restrictions, air strikes, and now a ground invasion in a constructive way. The radicals attack Israel even when they have no effective weapons, and so they cannot be effectively disarmed. The Palestinians do not have formal military forces that Israel can incapacitate, and in its previous efforts to incapacitate Hamas and Hezbollah by capturing or killing all of their members, Israel has failed. Nor do the Palestinians respond to deterrence. Prior to the air strikes and ground invasion, polling data indicated that a majority of Palestinians were against the rocket attacks. But Israel’s strikes enrage and embitter the Palestinians, further encouraging the cycle of violence. So, if Hamas and Israel are not effectively practicing self-defense, how might they prevent one another from inflicting further harm? Certainly not with additional violence–Hamas’ rockets encourage Israel to assault the Palestinians, and Israel’s assaults encourage Hamas to continue firing rockets and pursuing other avenues of violence. “Self-defense” is not the answer. To each side, a different recommendation is warranted. For each of these recommendations, we take a continuation of the other side’s mistaken strategy as a given, so that for Israel, it is assumed that Hamas continues to behave irrationally, and for Hamas, it is assumed that Israel continues to behave irrationally. After all, neither side can afford to wait for the other side to come to its senses–someone has to start acting rationally before rationality can be normalized. If you’re Israel, you want to further encourage the Palestinians to abandon Hamas and violence. You want the trend that was underway before this incident to resume–for the Palestinians to increasingly oppose violent resistance in favor of legitimate forms of protest. For this to happen, the Palestinians have to believe that they have other legitimate, efficacious options aside from using violence against Israel. Israel can further this belief by positively responding to Palestinian demands that are peacefully expressed. This means giving the Palestinian people hope by improving their standard of living, their access to health and education, their level of human development, and so on. It means opening up the borders and ending the Gaza embargo. While Israel might continue to prevent weapons from entering Gaza, it should do everything it can to alleviate the sense many Palestinians have that they are living in a cage. Ultimately, full abandonment of violence by the Palestinians will only happen when they feel they have a political state to call their own, and that means taking the kinds of steps that are necessary to bring that about, even if it means evacuating highly populated Israeli settlements in the West Bank. If you’re Hamas, you don’t want to give Israel any excuse to use violence against you. That means renouncing violence and adopting non-violent civil resistance, like Gandhi. This is not giving up much–the weapons Hamas possesses are weak and feeble. They are unable to use force to accomplish much of anything against Israel, and their use of force only serves to aid Israel in it’s international public relations war against Palestine. Hamas’ long-term strategy should be to turn public opinion in powerful countries (the US, Britain, Germany, France, etc.) against the Israeli occupation. To do this, Hamas needs to persuade these peoples that the Palestinians are victims of an immoral occupation. Right now, Israel is able to persuade many westerners that the occupation is legitimate on the grounds that it is necessary to protect Israel from an existential threat. This isn’t true–Hamas is very weak and no serious threat to Israel–but its use of rockets undercuts this truth. Hamas should go out of its way to show that it does not pose a military threat to Israel by practicing a way of life that is, if anything, excessively peaceful. Palestinians should take political action by peacefully attempting to cross borders they are presently barred from crossing rather than lobbing rockets across those same borders. In the meantime, both Israel and Hamas are perpetuating a cycle of violence, ultimately harming themselves as much if not more than they are harming their opponents. Every person who claims, on behalf of either faction, that they are just “defending themselves” is part of this problem. We can only start to consider the possibility that violence might be morally acceptable when it, at the very least, confers some benefit upon the user. At present, Israeli violence does not benefit Israel and Hamas’ violence does not benefit Palestine. Violence that does not benefit the user is not merely wrong, it’s stupid. I don’t take the Israeli side in the conflict. I hold Israel responsible for its overreaction to the kidnappings of the three teens (the mass imprisonments, house searches, and border closings). I am also opposed to the occupation of the Palestinian territories and to settlement construction. I consider many Israeli policies toward Israeli Arabs and Palestinians equivalent to those of the apartheid regime in South Africa. None of that however makes Hamas’ tactics effective or helpful for securing a better future for both Israelis and Palestinians. These are the numbers I found–if there’s an alternative source you think I should consider, I’m open to suggestions.